Edel Assanti presents 'A fair day’s wage for a fair day’s work', Babak Golkar’s debut London solo exhibition. The exhibition is the second installment in Golkar’s Return Project, a series of assemblage works where readymade consumer articles are dissected, transformed and reinserted into their wholesale environment. A fair day’s wage for a fair day’s work borrows its title from the motto of the American Federation of Labor; the exhibition takes labour as its central theme, addressing the role of the individual within large-scale commerce and mechanised production. Golkar initiates each artwork by purchasing an item from a major retailer. The item is brought to the studio for photographic documentation. The object is then dismantled and reconfigured into a new consumer article – an original artwork – related to the original in its physicality and content, but radically altered in each case. The new object is then documented, and along with the original photograph, presented as a diptych printed on an identical scale to the original object. Throughout the process, the original tags and labels remain intact. The new object is officially declared as an artwork by a carefully hidden authenticity accreditation note. The artwork is then returned to the store from which it was purchased with its original tags for a full refund. The store’s return policy determines the timeframe for the studio process behind each work. The returned art object enters into and circulates the inventory of the store and is once again available for sale at its original price. Following its alteration, the leftover materials from the original object’s reconfiguring are employed to form a residual object that accompanies the photographic diptych, exhibited together as a singular artwork. 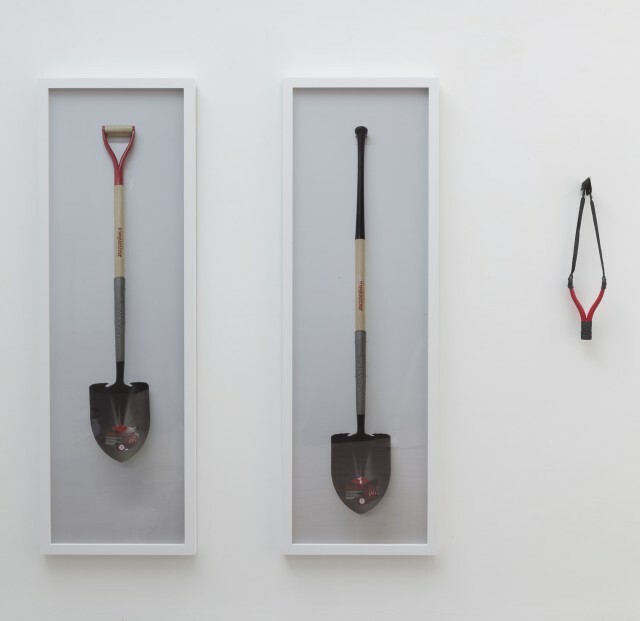 Each work in the exhibition is planned and executed around a specific concept within the theme of labour, specific to the original object’s broader allusion whilst examining issues ranging from geopolitics to workers’ rights and globalization. include Common Grounds, Museum Villa Stuck, Munich, Germany (2014); L'avenir: 9th La Biennale de Montreal, Musee d'art Contemporain de Montreal, Canada (2014); La Route Bleue, Boghossian Foundation, Villa Empain, Brussels, Belgium (2013); Come Invest in Us, You'll Strike Gold, Brot Kunsthalle, Vienna, Austria; Jameel Prize Exhibition, Casa Arabe, Madrid, Spain (2012).